Whether it’s to cook, eat, entertain, and socialize, the kitchen is an essential room of the home and family life. A kitchen with a proper function and decorations would set the mood for any home activities a family might have. Since homeowners value aesthetics as well as functionality, you’ll see a lot of homeowners start to change the style of their kitchen. But, everyone’s lifestyles and tastes are different. So, you would need a kitchen that mirrors your lifestyle and taste. While some prefer a more traditional design, others want a modern feel or flair – and it’s all down to personal taste. Whether it’s for a new house or remodeling, a designing project can be exciting, but it could also be a complicated process since there is a wide variety of style choices to choose from. You wouldn’t want a style that would become outdated in a few months or a design that wouldn’t reflect your personality either. So before designing your home, consider the style suitable for your kitchen. Several factors could help you decide on the right style for your kitchen. The architecture of your house is one of them. Many homeowners tend to copy the house’s style with the kitchen. Another thing that would influence its style is the layout of your home. In most older houses, for example, the kitchen space is often set apart from other living spaces so there would be more freedom to choose a separate style for the kitchen area. For some houses, appliances could also affect the design choices of the kitchen especially since the influx of using devices made from stainless steel. But, despite these considerations, it’s still your kitchen, and you should be able to do what you want with it. If you want, you can add unusual or quirky elements of a different style or inexpensive surface materials. There are a lot of styles you can achieve with paint and accessories that you can switch up every so often if you decide to do so. The whole project depends on you and your imagination so feel free to go wild when you want to. That being said, not everyone has a complicated taste. If you feel like these styles are too extravagant for your taste, then your best bet is to utilize a classic kitchen design. 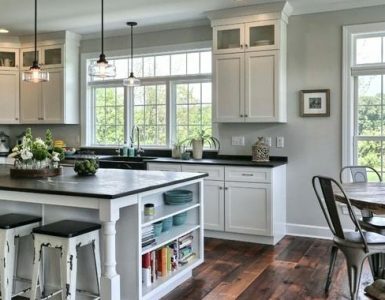 There’s a reason why a classic kitchen style is called “classic.” The classic look is just timeless so a kitchen styled in this way would look great today as they did decades ago. It would also not become outdated after many years to come which is perfect if you’re on a tight budget as you wouldn’t need to redesign for a long time. A classic kitchen also doesn’t need too many intricate details or complex color schemes, so it can be easily altered to match the home’s style or the tastes of the homeowner. Sometimes, the architecture of the kitchen is enough to influence a classic kitchen style. The simplest design you can do is including balance and symmetry in your plan. Our brain loves balance and symmetry. It draws us in because it helps create a sense of harmony and calm. One approach in bringing balance is to choose a center point in the kitchen. The center point is that one element that immediately draws your attention upon entering the room. In some classic kitchens, the countertops are often the focal point. Around that center, build symmetry around it and create a sense of rhythm. Remember also to keep in mind of the scale and proportion as well as the visual weight of the design elements. This doesn’t necessarily mean that your space needs to have a mirror-image of itself. Asymmetrical kitchens can still distribute its elements such that they balance out. Breaking an established pattern of symmetry can often be used to draw attention to any particular design element. It’s also frequently featured in simpler kitchen designs. A classic kitchen is also the style with architectural details that accentuate the space without being over-the-top. Unlike other kitchen styles, classic avoids popular or fleetingly fashionable features which can be distracting or call too much attention to itself. Classic kitchens don’t need extravagant ornaments and only requires simple lines and details. Consider adding a few simple features like legs on islands, feet or furniture-style toe kicks, paneled hoods and crown moldings. Whatever feature you choose, the key to creating a classic kitchen is to restrain yourself from overdoing it and straying too far into the realms of sleek uniformity. Since classic kitchens give a clean, fresh, and airy atmosphere that will make almost everyone feel comfortable. The color white is a highly versatile color choice for a classic kitchen. This clean and fresh color adds light and can make small spaces appear larger than it actually is. It’s also a well-known classic, but creating a classic kitchen isn’t necessarily limited to an all-white color scheme. That’s why you should include a mix of hues that offer a bit of interest to the eye while still maintaining neutrality. Try bringing in different tones of gray to create a soothing feel or incorporating elements such as brass and wood accents. For contrast, designers usually include the darker colors like black to break up the all-white scheme. The combination of black and white are one of the most popular forms of contrast you’ll find in any classic kitchen since it helps the eye rest from staring a single color. Kitchen cabinets are one of the essential kitchen elements for storage and decorations. It’s one of the first things that people noticed when they walked in the kitchen. Since it stands out too much, by merely changing your cabinet design, you can completely change the look of the whole kitchen. When aiming for classic kitchen design, consider changing the style of the cabinet door and start installing your cabinets with a simple shaker door. Since simple shaker door that comes from materials like birch, maple, chestnut, and sometimes walnut can make for a classic kitchen cabinet design that complements the classic kitchen style. Also, skip on choosing modern or overly ornate designs like a raising panel or flat-panel door, to make your door feel timeless and avoid being trendy. Countertops make just as much impression as a kitchen cabinet to anyone who walks into the kitchen. Updating your countertops are one of the design elements that can affect the look and feel of your kitchen. Homeowners who have their set their minds on a classic look often go with one of two ways: either black or white materials in the form of granite, soapstone, or cast quartz. While all of them are quite popular, out of all of them, granite countertops are the top favorite. Materials that are taken from nature like granite countertops instead of manufactured ones, like laminate or plastic, really help give that authentic, timeless vibe to your design to give off that classic look. Having a countertop made from a material with resistance to scratching, staining, and heat is also a welcome bonus. Instead of staining your floor, it’s better to choose wood with lovely brown shades, to begin with, and then just add a sealant on top. Wood floors are already smart investments. It’s an affordable product that lasts for a lifetime. Wood floors are also easy to clean and creates a healthy environment for any residents suffering from allergies. But perhaps, the reason why plenty of homeowners and designers love it is that of its charming and classic look it gives their interior. Hardwood flooring remains the best choice not only for sanitary purposes but because of its lasting appeal to any room. It’s a high-quality flooring that never goes out of style, making it a perfect fit for a timeless kitchen design. Since classic kitchens commonly use white as the dominant color, the warm woody tones of the hardwood flooring would never go wrong in your kitchen. There are a wide variety of hardwoods that gives a classic, warm, and natural look in the kitchen but in such a high traffic area, hardwoods like ash, mahogany, poplar, walnut, and oak are recommended more than pine and cedar since these are more prone to scratching and dents. Oak is especially well-liked since it’s not only sturdy, classy, and timeless but it also looks better as it ages. There are no strict rules when it comes to designing your own classic kitchen. Even a classic style which includes essential elements can be adaptable as the look and feel can be easily changed by adding a vintage, traditional, or modern touch. A classic design doesn’t necessarily restrict itself on this list. Even when you choose rich and intense colors like terra cotta or bright red, it’s still possible to consider your kitchen a classic. You can choose to add open cabinets, tiles, or to incorporate a personal style to a classic look. The great thing about a classic design is that you can incorporate anything that suits any taste, style, or budget into a classic look. The most important thing you shouldn’t forget is to keep the essential elements simple. Classic kitchens are designed to be simple and fresh, don’t make it complicated and ornate.